Looks similar to Torch of the Damned. What are the thoughts of this compared to Stormherald? Anyone find Stormherald still better because of the 4 sec stun on it? Well, the difference is if you are able to get nether vortexes or not. If you are, I would definately use Stormherald over this, and rather spend the arena points to other items. "1) The hit rating could free up either gems or an item like, for example, Red Belt of Battle that you'd only be wearing for hit once the S3 honor belt arrives. This is dependent on your gear, of course." Who cares? Hit rating is absolutely pointless and a useless skill in PvP. "Then there's armor penetration which is the new thing. It allows you to hit harder, consistently, thereby diminishing the effect (to some extent) of casters stacking resilience." Armor Penetration is not effective unless its stacked. Same goes for resilience, I think your looking at this from all angles when in reality your talking about PvP usage. Resilience is awesome but only for PvP (Unless your a druid and could use it to make yourself uncrushable) and Must be Stacked to be effective. "Lastly the conversion rate from agility to crit for warriors is something like 34 to 1%, whereas the conversion from crit rating to crit is 22.1 to 1%. So Vengeful gives essentialy 2.08% crit while Stormherld gives 1.23%"
You just went and talked about how awesome resilience is, So why are you stacking Crit??? AP is the new thing for PvP. People with 35% melee crit are getting 1 or 2 crits on people with S2 gear stacked resilience. Why take a more and more useless stat when you can take AP thats not reduced by a stat used by almost all PvPers now. Your numbers are seriously flawed. I'm currently using partial S2 gear, which is far off from the maximum resilience you can stack, and I reduce crit chance by 9%. So, no, it's actually quite a bit more than 7%. If I recall correctly, if you max resilience, it's a 12% reduction, and a 25% reduction on the damage of all critical strikes, which is actually pretty huge. Nothing sidesteps resilience, really--DoTs did, but that was fixed, and if you think stacking only AP will make you an arena monster, you're in for an ugly awakening. What you dont seem to understand is that +Hit doesn't effect your chance to hit in PvP. It only effects PvE. Put on a weapon that you have not maxed out yet. Lets say you have your 2H Hammer maxed out because you've used it since day 1. And lets say your 2H Swords is 200 points or so off from being completly maxed. Run over to a Mob with the 2H Sword on and swing away, you'll probably start lvling your 2H Sword up and miss every other swing, if not every time. My Point stands that in PvE, Hit Rating is the most important stat to have, but in PvP its worthless. It doesn't effect your chance to hit other players in PvP. Does anyone have a screenshot of this? If so, please post; I'd love to see it. Not to mention, what idiot would spend $300 for a string of code s/he could get him/herself? Rate this down please. This mace is THE choice for retadins. It has 616 DPS while Torch has 619. Pretty darn close, especially if you can't get into BT just yet. so once we get this weapon do we need to always keep 1850+ personal or what happens if we dont? what about shamans this or dual wielding the weaponsmithing rewards with another good off-hand? When season 4 comes out will these weapons or even the shoulders still require 1850 and 2000 personal / team raiting ?? Q: Will the ratings requirements be removed on the s3 weapons and shoulders next season? A: No, and this is new information as far as I'm aware, but the ratings will remain, however they will likely be lowered. Previously we had stated that the ratings would only apply to the current season's items, but that's no longer the current thinking or plans. As it stands currently the rating requirements will remain, but they'll be lowered as the new season's items are introduced. althought this weapon has more damage and ignores armour and more crit with all s3 your loosing hit... which ive noticed is afecting me alot in arena so im just wondering if its all worth it in the end? I currently don't use an arena weapon at all, and still manage to have 78 hit. 80 is the golden number. There's nothing wrong with socketing hit to get 80 hit. I should get a 5 str 4 hit gem, but I'm rather lazy. Like all of the S3 two-handers, just put executioner on it and you will see an increase in damage. A good alternitive to this is Stormherald ( http://www.wowhead.com/?item=28442 ), the extra 1% to stun can come in handy and so can the +crit from the +agility. I personally would use Stormherlad. The difference is not ability to get Stormherald. Firstly anyone can get the vortecies as long as you do gold grinding (dailies/mining/etc), and pay a guild to take you. 500g per nether used to be average on KT. Secondly this mace smokes Stormherald and here is why: 1) The hit rating could free up either gems or an item like, for example, Red Belt of Battle that you'd only be wearing for hit once the S3 honor belt arrives. This is dependent on your gear, of course. 2) The stun effect on SH was and still is negligible compared to Mace Specialization. 3) Resilience. 4) Armor Penetration. 5) 42agi vs 46crit rating? The fact that the hit rating is very situational and the benefit will vary based on your personal gear is obvious, but the last 3 reasons are fairly major. Resilience as we all well know by now is absolutely crucial, so having it on your weapon is a clear plus. Then there's armor penetration which is the new thing. It allows you to hit harder, consistently, thereby diminishing the effect (to some extent) of casters stacking resilience. Granted the two have no direct relation but it will be an overall increase in damage output if you go for armor penetration. So you'll want to be stacking as much of that as possible. In short, there's simply nothing better about Stormherald. Arena points were made for spending, and the arena gear is designed for arenas... so choose accordingly. Quoted from above; S3 weapon is superior in all cases. Of course, altogether, as an arena player, i choose this over Stormherald. but if your struggling on working at that 1850, Stormherald is a very good choice until you get this, if you have the rating, get this. and Stormherald is more commonly noticed as being around T5 content. And of course, the +crit on Vengeful gives more crit than all the agility on Stormherald. So i think that there is no doubt, that this is a better all-rounder than Stormherald, and a very good mace indeed! These now cost 3000 honor in S4, with a personal rating requirement of 1800. Seems like the discount on last season's 2H weapons is significantly more than it was from S2>S3. I think you mean arena points ? As of June 24, 2008, this weapon, along with other Season 3 weapons, now have a 15% discount and 50 point reduced rating requirement for both personal and team arena ratings. The price for this weapon should be around 3188 arena points, and 1800 personal and team arena rating requirement. 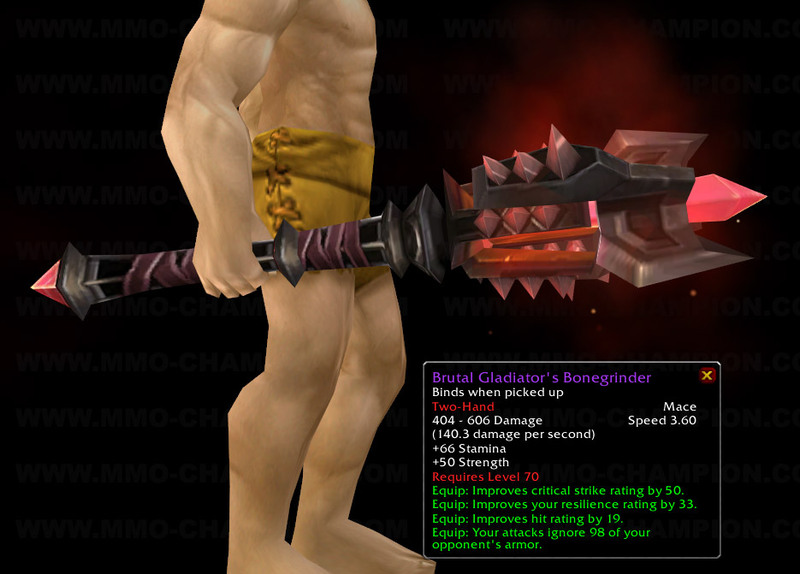 With transmog comming out...will you be able to get this mace? As of 10/6/11, Ecton Brasstumbler in Gadgetzan is selling all the Vengeful gear on the PTR. Here's hoping that it stays this way. So is this mace still available? Cuz I tried getting it on my 70 pally and it didn't show up in tanaris.. It's available in nether storm Then? Easy to acquire mace with a nice death knight aesthetic. It looks quite nice with the DK's T10 (available from Horace Hunderland in Dalaran for JP) as well as with the raid finder version of their T13 (though the shoulders look a little off).